Do you feel something wrong with your heart palpitation? How about unusual sweating, sleeplessness and fatigue? These mysterious symptoms may have something to do with your thyroid gland. According to some medical studies, 70% of people have some troubles with thyroid gland without knowing it. Don't you know that thyroid gland-related sickness may lead to heart disease and stroke (cerebrovascular accident)? The thyroid gland appears very much like a bat or butterfly in its shape. It is located just below the Adam's apple. 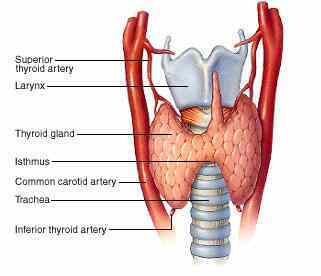 The thyroid is vital for growth and development of our body as well as replacing old cells (metabolic regeneration). The thyroid does its job of regulating the body by releasing "thyroid hormones" that affect most organs of the body. If the thyroid produces too much thyroid hormone, the replacement of cells will accelerate, which causes weight loss, faster heart beat, short of breathing, excessive sweating, shaking or trembling of hands, and diarrhea. If the thyroid hormone decreases, the replacement of cells will decrease, too. This will cause body swelling, increase in weight, decrease in heart beat, low body temperature, dry skin, constipation, dullness, and nausea. The thyroid hormone is crucial to almost all bodily functions. Thus, medical scientists believe that most diseases may have something to do with the thyroid gland. In 2005, we found that there is a slight difference in male and female hands by the hormone's feature, which is the length of ring fingers. According to the study, the length of ring and index fingers are the same for females, while males have longer ring fingers. Males who are active in sports-related activities have much longer ring fingers. We have conducted studies with hundreds of people for verification. 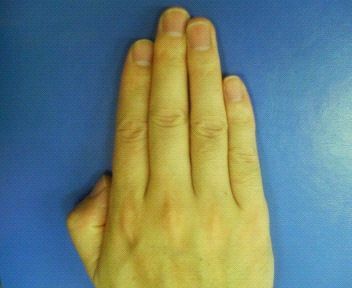 By taking a look at the finger length, you may be able to identify homosexuality without seeing their organs. Although this is not an accurate indicator, it's true on most cases. Some people might say that their index and ring fingers are identical, although they are male. They might be more womanly. And some of them might say that their ring finger is longer than their index finger, yet they belong to female. They may be active manly. This is a male hand. Notice that his ring finger is longer than the index. This is a female hand. Notice that ring finger and index are identical in length. The inventor was curious about the structure of the palms when he was in the hospital. There he found a mysterious point. Most patients who suffer from viral diseases or incurable diseases have a similar pattern of palm figure as seen below. The inventor discovered that most patients who are affected by the negative energy or suffering from viral diseases have different patterns of left and right palm figure. Most people who are disease-free have both palms identical (even). However, sufferers have amazingly uneven palms (their left fingers are shorter than the right or vice versa, or the palmar (or palm) creases are not even). Note: There are some cases where the uneven pattern of the palms is caused genetically. 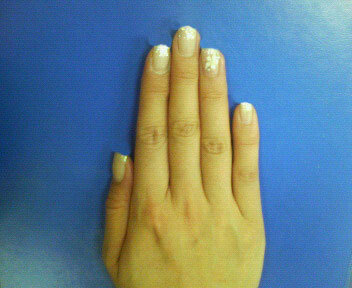 The author, Mr. Takano found that the difference in length of the fingers is caused by the negative energy. Now, it is very evident that the negative energy controls the amount of hormone in the thyroid glands, which lead to various maladies. Mysterious physical conditions are caused by the malfunction of thyroid gland. In fact, there are many patients who never expected that their condition were caused by defects on thyroid glands. Let's take the case of a retired factory clerk, who noticed that he began to have difficulties in writing letters and shaking hand while holding his ballpoint pen. He also noticed that he easily perspire and get fatigued. He was thinking that it is due to stress after his retirement from factory work. Let's take another case of a middle-aged woman, who was thinking that her irregular heart beating and abnormal palpitation were caused by menopausal disorder. It is because when she was diagnosed by her family doctor, there seems to be no defect at all. Let's take another case of a middle-aged man, who was diagnosed with gastritis at his family doctor, and was taking medicine for intestinal disorders prescribed by his doctor for more than a year. He had also been suffering from diarrhea, fatigue, uneasy feeling, and many other unexplainable symptoms. Finally, he submitted himself to a general hospital for general checkup where he was diagnosed with thyroid gland problems. How does the hormone work for our physical body and overall health? Thyroid glands receive a signal from the brain, and produce hormones, specifically thyroxine (T4) and triiodothyronine (T3). Thyroid hormones are carried through blood vessels. Once the hormones reach to the designated part of organ in the body, the brain sends signals to work accordingly. If there's too much production of hormones, the designated parts of the cell or organ fail to work jointly. The abnormal work caused by over-production of thyroid hormones may also be a sign of thyroid disorder called "Graves-Basedow disease". What is the real cause of thyroid gland abnormal hormone production? Clinically, there is no definite answer for it at the moment. However, doctors believe that the immune system fails to communicate with correct signals to the brain and thyroid glands and the part where there's in need of right amount of thyroid hormones. From these statements, most diseases we suffer seem to have some relation with the thyroid glands. As we mentioned in the beginning, 70% of populations are affected and it may be for real. Our study indicates that most abnormal thyroid hormone production is caused by the negative energy. The PYRO-ENERGEN is the answer to eradicate the disease!